Diamonds are the Earths treasure. The exemplified beauty in their color and clarity are an effect of natural phenomena; but a diamond’s cut is solely the result of the talent and craftsmanship of the master cutter. Master craftsmen reveal the concealed beauty of a diamond in the rough. A well cut diamond can attain and demonstrate brilliance regardless of color or clarity. How much a diamond reflects and releases of its inner beauty is determined by how well it plays with light – essentially its Cut's overall brilliance and symmetry. Cut is the factor that fuels a diamond’s fire, sparkle and brilliance. The AGS and GIA Laboratory approach cut grading differently, but both are proven systems. Diamonds awarded the top grade by these laboratories; Excellent with GIA or Ideal (0) with AGS are near the top cutting quality of diamonds available today. AGS or the American Gem Society assesses cut grades on round diamonds and some fancy shapes. The AGS cut grade system includes numeric ratings from 0 (Ideal) to 10. From its foundation AGS focused on cut assessment for both the trade and consumers. They pioneered the "Ideal" cut grade for the round brilliant diamond and provided user-friendly guidelines. AGS created the first scientifically reviewed, impartial, and repeatable cut grade method in the industry. For these reasons AGS is far stricter and only less than 3% of the world's round brilliant diamonds can earn the AGS top grade of 0 or 'Ideal’ with regards to cut. The grading system takes into account 11 factors: brightness, dispersion, leakage, contrast, girdle thickness, culet, weight ratio, durability, tilt, polish and symmetry. 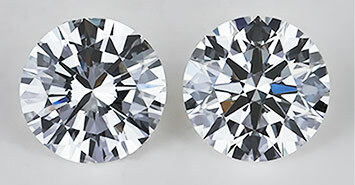 Currently, GIA only assesses cut grades on round brilliant diamonds in the D-Z color range. The GIA cut grade system includes ratings of Excellent, Very Good, Good, Fair and Poor. A diamond's initial cut grade is estimated by the GIA Cut Estimator, the final assessment is determined upon proportion and performance of the diamond. Each diamond is blindly assessed in the grading process by multiple gemologists. The grading process takes into account five major factors: proportions (measurements, critical crown and pavilion angles), girdle thickness, culet size, polish and symmetry. Because the GIA cut grading system provides an objective assessment of a diamond's overall cut quality, each cut grade represents a range of proportion sets and diamond appearances, each of which may conform in different ways to the characteristics of that grade. If you have any questions regarding Cut, the Four Cs, or anything else that comes to mind please Contact us or Call (888)860-6430, we will be happy to assist you.